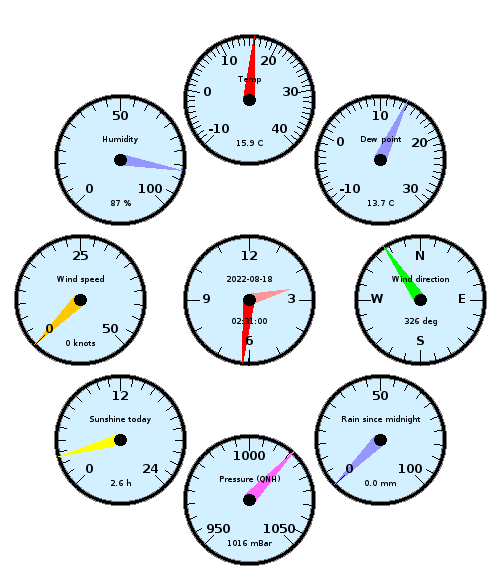 Note: if the wind speed is zero, the wind direction (if shown) is that when the wind was last blowing. There is a known issue with the sunlight and rain sensors sometimes over-reporting readings. We are investigating how best to fix this and we should be able to correct archived records once the problem is resolved. Please drop us a line if you discover any inaccuracies in the reported weather data, or if you have general feedback, comments or questions. Inaccuracies in the weather data. Mailing list for announcements regarding service changes or recording errors. If you wonder what "Dew Point" means, see here for a simple explanation, or here for more than you want to know.